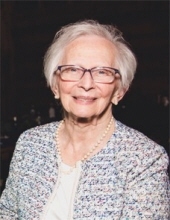 Janet Alta Carlson, age 81 years, of Holland Township, NJ, passed away on Saturday, February 9, 2019 at her home surrounded by her family. Born in Boston, MA, June 13, 1937, she was the daughter of the late Wilmot and Eula Lyman Babcock. She had resided in Hunterdon County, NJ since 1974. A graduate of Hood College, Janet was a retired nurse. Mrs. Carlson was a member of Calvary Episcopal Church, Flemington, NJ, where she loved singing in the choir. Her beautiful voice and love of music led her to participate in many choral groups over her lifetime. Surviving are three daughters and sons-in-law, Cheryl and Raymond Johns of Watchung, NJ, Karen and Scott Holmes of Ringoes, NJ, and Debra and Darren Dalley of Milford, NJ; a son and daughter-in-law, David and Amy Carlson of Malvern, PA; her sister, Patricia Babcock, of Storrs, CT; ten grandchildren; and two great-grandchildren. Funeral services and interment in Calvary Episcopal Church Memorial Garden will be held Saturday, May 4, 2019 at 10:00 AM under the direction of the Holcombe-Fisher Funeral Home, 147 Main Street, Flemington, NJ. In lieu of flowers, the family has requested donations be made to Hunterdon Healthcare Foundation, 9100 Wescott Drive, Suite 202, Flemington, New Jersey 08822 to benefit Briteside Adult Day Center. Guaranteed delivery before Janet's service begins. "Email Address" would like to share the life celebration of Janet Alta Carlson. Click on the "link" to go to share a favorite memory or leave a condolence message for the family.